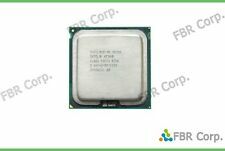 2pcs Intel Xeon X5355 Quad-Core 2.66 GHz 8M 1333MHz Processor PC Server CPU. Condition is Used. Shipped with USPS First Class Package. Unit shows light scratching and signs of wear device wide. The pictures include everything that you will get. Xeon CPU/Processors. Point of Sale. Generic Picture Used. Bare CPU/Processor only. Apple & Mac. Cables Connectors. Power Protection. Core 2 CPU/Processors. LGA 771/Socket J. Clock speed (GHz). Processor Type. Bus speed (MHz). Socket Type. Processor SL9YM 3A1384. X5355 2.66GHz 8MB 1333MHz. and we’ll leave the Light on for Ya! Part Number 43W6088. Product specifications. Reference the RMA number outside of box. Our servers and parts are tested for full functions, R2/Ready for Reuse. Check parts for our serial numbers before sending back. We do not support export outside the United States. No exceptions. Part No SLAC4. QUANTITY 10 X PROCESSOR INCLUDED. Part number: SLAEG. Model: X5355. Socket: LGA 771. L2 Cache: 8 Mb. CPU PROCESSOR. Part Number 43X5166. Product specifications. Reference the RMA number outside of box. Our servers and parts are tested for full functions, R2/Ready for Reuse. Check parts for our serial numbers before sending back. This unit is for use in the United States only. Once you have successfully reached the checkout page, simply follow the instructions from there. Tested for Key Functions, R2/Ready for Resale. What'sNOT Included. Part Number 40K1251. For defective parts/systems Our servers and parts are tested for full functions, R2/Ready for Reuse. 1900 Surveyor Boulevard. Reference the RMA number outside of box. Check parts for our serial numbers before sending back. Part Number SLAC4. Processor Number X5355. Include With Processor. Instruction Set 64-bit. Part Number SL9YM. Processor Number X5355. Include With Processor. Instruction Set 64-bit. Part Number CU749. Product specifications. Reference the RMA number outside of box. Our servers and parts are tested for full functions, R2/Ready for Reuse. Check parts for our serial numbers before sending back. Product specifications. Reference the RMA number outside of box. Our servers and parts are tested for full functions, R2/Ready for Reuse. 1900 Surveyor Boulevard. Check parts for our serial numbers before sending back. For defective parts/systems Our servers and parts are tested for full functions, R2/Ready for Reuse. 1900 Surveyor Boulevard. Reference the RMA number outside of box. Check parts for our serial numbers before sending back. Part Number 42D3802. Product specifications. Reference the RMA number outside of box. Our servers and parts are tested for full functions, R2/Ready for Reuse. Check parts for our serial numbers before sending back. Part Number XM459. Product specifications. Reference the RMA number outside of box. Our servers and parts are tested for full functions, R2/Ready for Reuse. Check parts for our serial numbers before sending back. MODEL NUMBER: SLAEG. Review pictures for more details. SKU Number: 169816 | SN: . Part Number SLAEG. Product specifications. Reference the RMA number outside of box. Our servers and parts are tested for full functions, R2/Ready for Reuse. Check parts for our serial numbers before sending back. Part Number X5355. Product specifications. Reference the RMA number outside of box. Our servers and parts are tested for full functions, R2/Ready for Reuse. Check parts for our serial numbers before sending back. 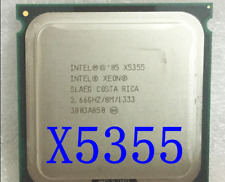 Intel Xeon X5355 2.66GHz 8MB 1333MHz SLAEG SL9YM SLAC4 LGA771 CPU Processor. Condition is Used. Shipped with USPS First Class Package. 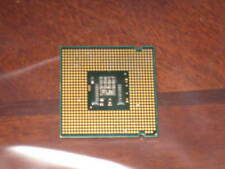 Lot of 7: Intel Xeon X5355 2.66GHz/8MB/1333MHz Quad-Core SLAEG Processor CPU. Tested, fully functional. Ships quickly and carefully. Thanks! Part Number 43X5196. Product specifications. Reference the RMA number outside of box. Our servers and parts are tested for full functions, R2/Ready for Reuse. Check parts for our serial numbers before sending back. There are 4 SLEAG, and 2 SLAC4. They are all 2.66GHZ/8M/1333. Part Number FY277. Product specifications. Reference the RMA number outside of box. Our servers and parts are tested for full functions, R2/Ready for Reuse. Check parts for our serial numbers before sending back. Part Number SL9YM. For defective parts/systems Our servers and parts are tested for full functions, R2/Ready for Reuse. 1900 Surveyor Boulevard. Reference the RMA number outside of box. Check parts for our serial numbers before sending back. Eight Core 2.66GHz CPU UPGRAGE KIT Dell Precision 490/690 X5355 Xeon Matched pair heat sink upgrade kit. This is an upgrade kit for the Dell Precision 490 and 690. Yes that's 8 total cores. Precision 490's GU083 motherboard are Dual/Quad ready. 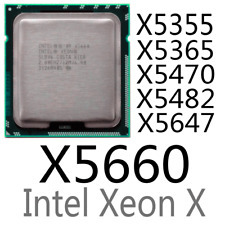 Xeon X5355 SLAEG x 8 units. Xeon X5460 SLANP x 2 units. Xeon X5450 SLASB x 2 units. Xeon 5130 SL9RX x 7 units. Xeon 5130 SL9RX x 1 unit. All are Xeon units. All were pulled from working machines, each has been tested, the old thermo-paste has been cleaned off, and they are ready to go. Part number QVQE QVQF QVRD QWTM SL9YM SLAC4 SLAEG. Core steppings ?. B3 (QVQF, SL9YM, SLAC4). CPUIDs 6F7 (SL9YM, SLAC4). G0 (QWTM, SLAEG). 6FB (QWTM, SLAEG). Socket Socket 771 / LGA771. we specialize in computer accessories and so on. 2 units E5335 SLAEK 2.00GHZ/8M/1333. 2 units E5335 SL9YK 2.00GHZ/8M/1333. 10 units X5355 SL9YM 2.66GHZ/8M/1333. 6 units E5345 SL9YL 2.33GHZ/8M/1333. This is an upgrade kit for the Dell Precision 490 and 690. Yes that's 8 total cores. Precision 490's GU083 motherboard are Dual/Quad ready. Not compatible 490 motherboards: DT031,F9382. Precision 690's MY171 motherboard are Dual/Quad ready.